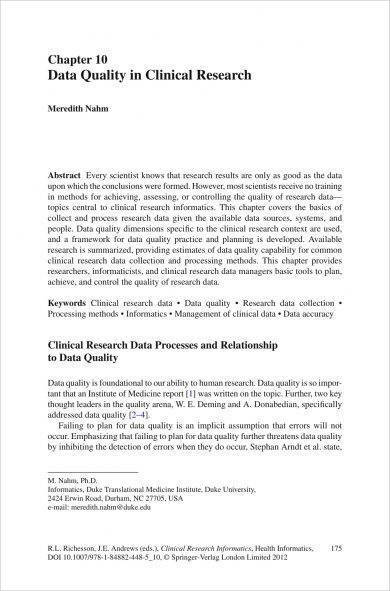 A data quality assurance plan is a document that contains strategies and tactics that can be used in ensuring the quality of data used in a specific undertaking. 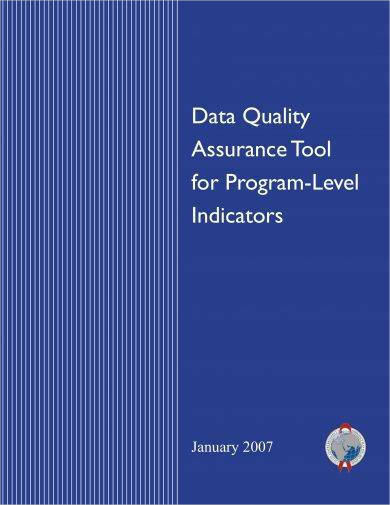 In comparison to software quality assurance plan examples, a data quality assurance plan focuses more on existing details and information rather than the systems that gather all specific data used. The data quality assurance plan that you will come up with by putting together call-to-actions, observations, strategies, and research study results can help your organization to easily identify the errors or lapses in processes where particular data are used. This can help you prepare and develop counteractions that can eliminate the potential of data errors to affect the business and cause operational problems or concerns. 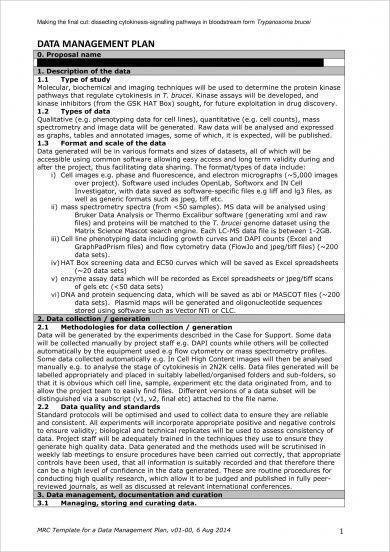 We listed a number of data quality assurance plan examples in PDF that can serve as your references and document guides whenever you would like to immerse in the development of your own data quality assurance plan. Browse through the entirety of this post and download any of the available examples while being aware of different information about data quality assurance plan with the help of the relevant discussions that we have prepared. The first thing that you need to do when you want to develop a data quality assurance plan is to have a full understanding of what the document’s usage is all about. It is important for you to be aware of the scopes and limitations of its usage so you can properly develop one that will work best for the advantage and intentions of your organization. You may also see advertising plan examples. 1. 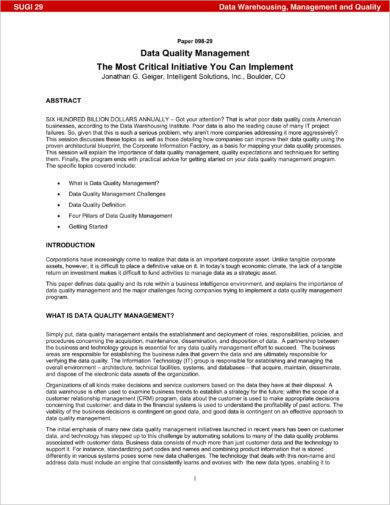 A data quality assurance plan contains routine measures that can help organizations ensure the quality level or condition of the data that they are using. It is important for these measures to be described precisely and appropriately so that there can be clarity with how they can be incorporated in the assessment or evaluation of specific data used by the business or any other entity. You may also like risk plan examples. 2. A data quality assurance plan focuses on the identification of the key attributes that are expected to be observed in every data for it to be considered as something that has high quality. These attributes include the data’s timeliness of development and usage, accuracy or precision, integrity, validity, and reliability. You may also check out weekly plan examples. 3. A data quality assurance plan can help organizations to outline its systems for data routine monitoring. This means that any program where particular data will be used can have lesser reports of data assessment bias, estimation errors, measurement inaccuracy, and data transcription failures. With this, data processing can be more precise and more accurate. You might be interested in evaluation plan examples. 4. 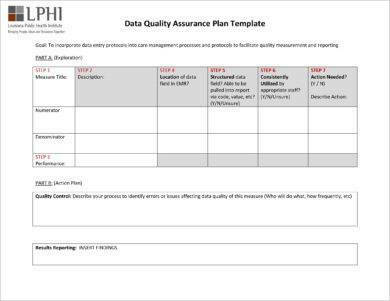 A data quality assurance plan, just like a health and safety strategic plan, can set all the terms and conditions of the activity where the document will be used. It can also specify all the limitations that are needed to be looked into to ensure that particular regulations and protocols are followed within the entire undertaking. 5. A data quality assurance plan can provide a timeline in which the assessment for the quality of internal data used will occur. 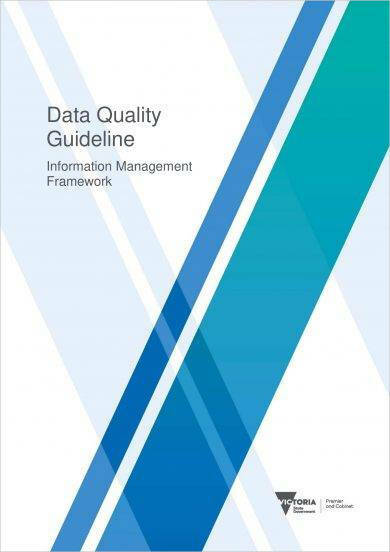 This document describes all the processes that are needed to be done within specific time frames to ensure the credibility and timeliness of all functions related to data quality assurance. You may also see daily plan examples. What Makes a Data Quality Assurance Plan Efficient and Effective? 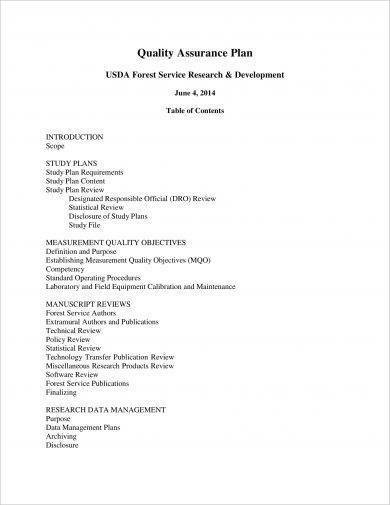 Just like when developing a security strategic plan and other kinds of printable work action plan examples, there are actually a variety of elements and factors that are essential to be highly considered so that you can ensure the efficiency and effectiveness of the data quality assurance plan that you will develop. Looking into all the important details and areas of consideration can help you build a document with a strong foundation. 1. Ensure that you have the appropriate amount of workforce that will allow you to execute all the strategies and call-to-actions that you have listed in the data quality assurance plan. It is important for your staff capacity to be considered as this can also reflect the attainability of your plan of action. 2. List down all the training programs and relevant activities that you need to develop so that your workforce can be knowledgeable of the proper development, usage, and maintenance of the data quality assurance plan. It is important for you to come up with different efforts of learning so that you can immerse your employees and all the key persons within the processes of using a data quality assurance plan in the best and most efficient way possible. You may also see annual plan examples. 3. You have to make sure that the document of data quality assurance processes are complete, at hand, and readily available. This is very important as you need to discuss all the regulations and protocols that you will follow to processes, auditors, collectors, researchers, and other entities who you will be working with during the data quality assessment, evaluation, and reporting. You may also like financial plan examples. 4. Develop different systems that will allow you to store, update, and maintain data. Ensure that the history of data updating is available so that any changes can be recorded while still retaining and safeguarding the original files or data that are used for a specific program, project, or activity. You may also check out management plan examples. 5. Be aware of the resources that you will be needing to fully execute your plans. Your data quality assurance plan will only work as you envision it to if you have the support of the management and all the stakeholders of the organization. Moreover, you can only push through with the data quality assurance plan implementation if you have the adequate logistical and financial resources that can back up your general action plans. 6. Present an organizational structure and work designation chart. This can help you create the lines for decision-making procedures and internal communication. 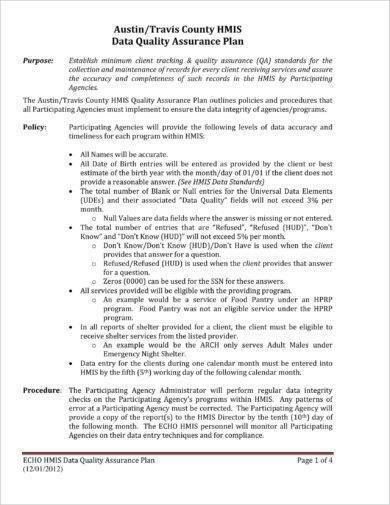 More so, this can make the supervision of using the data quality assurance plan more effective. You might be interested in quality plan examples. A workflow and workforce structure can also give the representation of the obligations and responsibilities of each member which can promote work ownership and accountability. 7. Come up with clear tactics and strategies that will help you respond to concerns, issues, and problems with regards the systems that you are using for data usage and assessment. You also need to know how to properly treat different kinds of data especially those that are proven to be faulty or unresponsive. You may also see training plan examples. 8. Know the methodologies, procedures, and mechanisms that you will incorporate in the processes of routine cross-checking. It is very important for you to ensure that all details and general reports are accurate and precise so that you can focus your time and efforts on looking into the specific data that you need to improve, change, add, and/or remove. 9. Be strict when implementing your protocols and procedures for database entry, management, and coordination. It will be best if you will have database backups for the benefit of your organization and its operations. 1. One of the most important things that you need to do is to ensure that you have a set of data quality requirements. This will allow you to properly describe and define the measures and metrics that you will use to know the level of data quality that you would like to achieve and keep on using. You may also see business plan examples. 2. 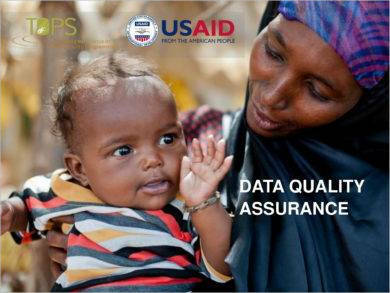 It is highly recommended for you to assess new data so that you can make a quality baseline. Doing this will allow you to group data sets that have the same data qualities which you can use for comparison and evaluation. 3. You should come up with ways on how to determine data that has the potential to be erroneous. Being able to know the tactics and strategies that can make it easier for you to assess data can contribute to the effective usage of the data quality assurance plan. Aside from identifying data that are not of quality, you should also find ways on how to mark this data and how to properly deal with them. You may also like event plan examples. 4. It is essential for you to establish mechanisms for data flow control. With this, you can easily be alerted whenever there are differences that has occurred with the comparison of data within data sets. 5. Make sure that you will not forget the formats of the data that you are using. This will depend on the processes that you have implemented to have or obtain the data at hand. Keep in mind that you should execute the same processes and techniques when acquiring specific and similar data so that you can present data sets that have the same outcomes as well. You may also check out sales plan examples. 6. Develop a printable work action plan that can make it more efficient for you to ensure that you will dictate accountability and work ownership especially when it comes to the implementation and execution of processes that are related to semantic metadata management. If you can succeed in doing this, it will be faster and easier for you to keep an eye of data quality problems as there are point persons who are made responsible to look into particular issues and data-related concerns. Getting Ready to Create a Data Quality Assurance Plan for Your Organization? 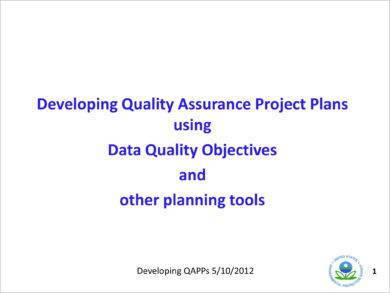 Do you think that you are already prepared to create your own data quality assurance plan? If you still have doubts at the back of your mind, make sure to use references that will guide you in the creation of a well-formulated and properly laid out data quality assurance plan. You should always remember that it is not only the content of the document that matters but also the way you present it to your audience. You may also see transition plan examples. Having references like the downloadable examples in this post can give you an idea on how you can make the most out of your discussion, explanation, and presentation. Every quality management plan may seem like a document that is hard to develop and put together. Whether you are dealing with employees, processes, or data, analyzing the ways on how you can make the most out of their usages or functions as well as ensuring that they are adhering to particular qualifications may seem like a tedious and winding task. If you are planning to start the development of the data quality assurance plan that your organization will use, do not forget the items that we have discussed in this post as well as the things that you have observed from the examples that we have provided.